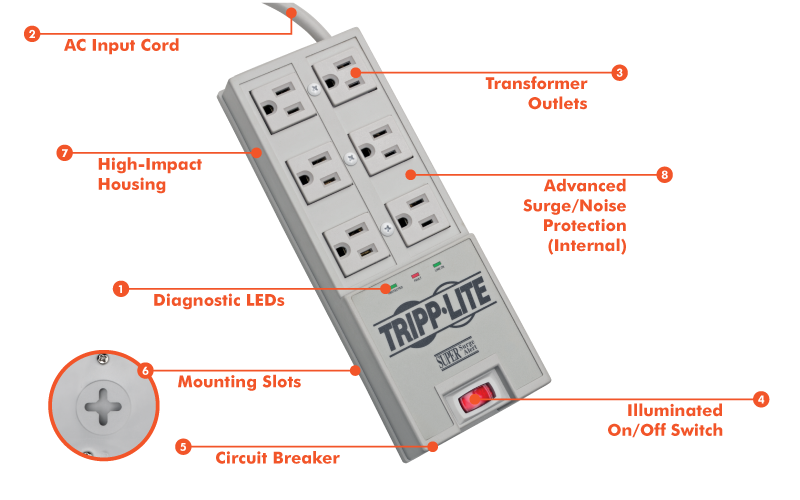 The TR-6 Surge Suppressor from Tripp Lite has 6 outlets and a 1.83 m (6-ft.) cord with a space-saving right-angle plug. The unit has 2420 joules of surge energy absorption to handle the strongest surges. Diagnostic LEDs alert the user to potential power problems. Compatibility TYPICAL APPLICATIONS: Personal computers, CAD/CAM/CAE workstations, network nodes, fileservers, point-of-sale terminals, audio/visual devices, and more. 2420-joule surge protection rating – More joules mean more protection! If your connected equipment is damaged by a surge—even a direct lightning strike—Tripp Lite will repair or replace it up to the value of the Ultimate Lifetime Insurance. If the “Protection Present” LED ever goes out, simply return the surge protector to Tripp Lite for a free replacement. And if you ever have a question, our Chicago-based tech support team is standing by ready to assist you free of charge. All trademarks are the sole property of their respective owners. Tripp Lite has a policy of continuous improvement. Specifications are subject to change without notice. Images may differ slightly from products. Tripp Lite uses primary and third party agencies to test products for compliance with standards. Go to Tripp Lite's website for more information, including complete warranty terms and conditions.